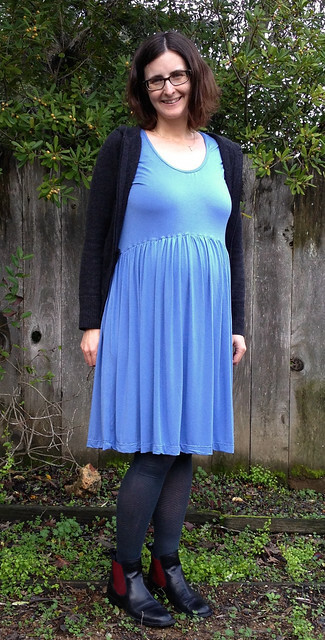 This dress was inspired by two things: a favorite non-maternity dress I made a few years ago (and wear all the time – even now! ), and this dress made by the fabulous Megan Nielsen. I wanted something comfortable, expandable and that still felt like me. I started with the plantain top by Deer & Doe and used a sz 38 with a little extra room added to the bust. I shortened the bodice and added a slight curve to the front. The skirt is just a gathered rectangle that is a bit higher in the front so it matches the curve in the bodice. I made the skirt panels as wide as I could and then gathered them by sewing them on to some 3/8″ elastic I had handy. The fabric is heavy and has a lot of stretch, so I hoped this would keep the waist from stretching out of shape. The dress has short sleeves and I finished the neck with a narrow band and the skirt with a double needle hem. I wore this to my baby shower a couple weeks ago (thanks to my awesome sisters for throwing it!) and am very happy to have this dress in my closet now. It’s nice to have something that fits my current proportions – amazing how good that feels. I expect it will be with me to the end now that there are just 2 more months to go! I’m linking up with Gray All Day’s Sew it Chic – check it out. Congratulations on baby, what an exciting time. Dresses like this are great post maternity too when you still have a bit of a bump. I love the Rachel Comey inspired maternity top too! Thank you! Very exciting. 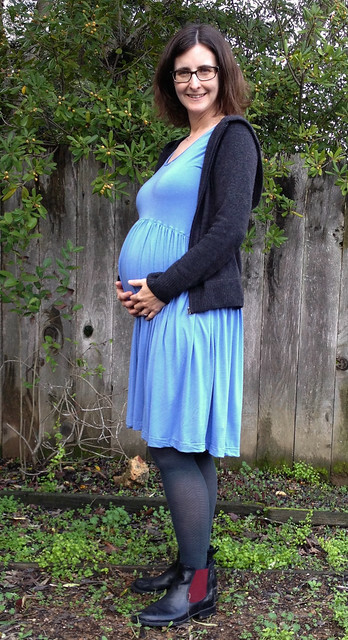 And glad to hear that this dress may work well post partum – that’s encouraging! 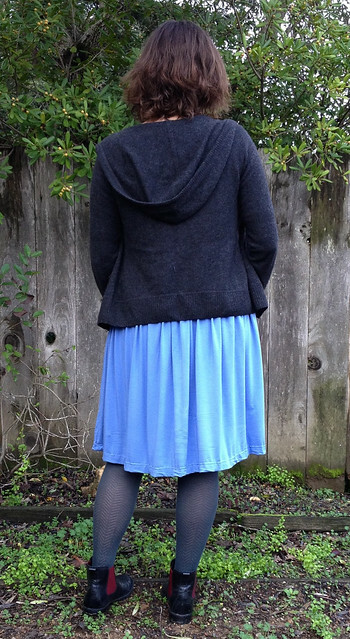 The dress looks great and the bamboo knit looks really soft and comfy – even in pictures. I need to get over to Stonemountain one of these days. It is! Totally worth the trip to Stonemountain – even from Petaluma, although I’m glad they sell online now the store has a great selection and the sale floor upstairs is excellent. Cute dress! That fabric looks amazingly soft! Thanks Meg! It absolutely is. Really darling dress on your cute pregnant self! Thank you Carolyn! Still feeling great which means more sewing to come! This is awesome! I was all about the loose flowy knit dresses when I was pregnant – anything tight made my skin crawl (like, seriously, my skin was so weirdly sensitive when I was pregnant, it was a constant annoyance). For this reason, my summer baby, Maggie, made for an easier pregnancy because I didn’t need to cover up as much! You look fantastic and I’m very excited for your new arrival!